Light fog lifting with the promise of a warm and sunny day before us, we headed to the north end of Escambia County anticipating that we might find an American Golden Plover. One had been reported from the Ft. Walton holding ponds so we had hope. These early spring migrants returning from wintering in northern Argentina, Uruguay, Paraguay and southeastern Brazil would be in open fields if we could find them – or – at least one of them. Most fields were stubbled corn, waves of blooming wild mustard, or freshly turned, weedy and wet. There were no American Pipits to be found, sparse sparrows, only a handful of raptors, and no American Golden Plovers. We birded hedgerows and catfish ponds racking up a fine list of wintering and resident birds while we walked railroad tracks and field margins. Then clouds gathered in glowering clumps moving in from the northwest. Not much rain was forecast, so on we birded until a downdraft dropped the temperature from 74 to 58 in a few short minutes. So, we birded from the car in our tee shirts (hey, it was going to be 70-something, right?). The sun crept out intermittently between clouds, and then the ceiling lowered and raindrops turned dirt-road dust on the car to runny brown streaks. Nonetheless, it was a fun day birding the sparsely populated north end of Escambia County. We tallied 67 species including Ross’s Geese and Swainson’s Hawk, then serendipitously finding a drained catfish pond full of shorebirds including very early Pectoral Sandpipers. The rain made us pack it in, and we headed home. Just south of Molino, we glanced skyward to find hundreds of Turkey Vultures streaming horizon to horizon southward on stiff wings under low, threatening clouds. We quickly pulled off the road to count as many as we could before they disappeared behind a wall of pines. Birds were as low as a few hundred feet to others barely visible and close to the thick clouds ahead of the advancing squall. We tried to estimate numbers by blocking them off by twenties, but that proved futile. How many passed before we spotted them, we couldn’t guess. Lucy finally blocked them off by the hundred and came up with an estimate of 450 of those still in view! This was a long column of birds migrating NE from Central America and Texas on a collision course with the advancing front. 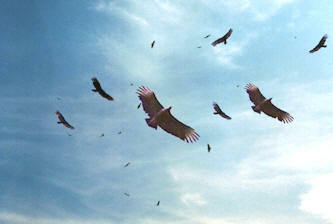 With a lowered ceiling and rain ahead, conditions were poor for birds that rely on thermals for migration! On encountering the front, they turned south and called it a day. The big question is where they might have spent the night since they were headed toward the more populated area of the county. Now that would have been a spectacle worthy of Hitchcock! 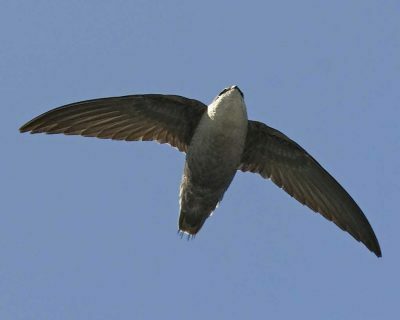 Two CHIMNEY SWIFTS were spotted at Eastman/Taminco Sanctuary. These were the earliest ever arrivals of that species by 17 days! The earliest ever had been 11 Mar 1955! Also early was a SWALLOW-TAILED KITE reported at Eglin AFB today. A N. PARULA WARBLER was heard singing a few days ago and PURPLE MARTINS are moving through. Spring migration is underway! !